The City of Jersey City is planning for substantial growth along its western waterfront with a mix of new residential and commercial uses on former industrial sites. West of Route 440, a new neighborhood is envisioned, with apartment buildings, commercial spaces, parks and streets. The success of this new development depends on new or enhanced transit service that creates a convenient connection between the western waterfront of Jersey City and existing transit services, including the Hudson-Bergen Light Rail (HBLR). The HBLR Route 440 Extension Project is being planned to provide convenient transit access for existing and future residents of the western waterfront area. HBLR is a 17.5-mile light rail system that operates in Hudson County and serves the cities and townships of Jersey City, Hoboken, Bayonne, Weehawken, Union City, and North Bergen. HBLR has three routes: Tonnelle Avenue, operating between North Bergen and Hoboken; 8th Street, operating between Bayonne and Hoboken; and West Side Avenue, operating between Jersey City and North Bergen. The West Side Avenue Branch operates service between the West Side Avenue Station in Jersey City and Tonnelle Avenue in North Bergen. The proposed HBLR Route 440 Extension Project would extend that service from the West Side Avenue Station to a new station farther west. To date, preliminary conceptual engineering has been conducted to create an initial design concept for the extension project. As envisioned, a new viaduct would be extended from the West Side Avenue Station platform across West Side Avenue, through the existing station parking lot and across Mallory Avenue, through the next block and across Route 440. A new terminal station would be created west of Route 440 that would be integrated into the new Bayfront development being planned there. 1. An alternatives analysis was conducted that identified possible alternatives to meet the identified need for transit enhancement and then selected a locally preferred alternative, the extension of HBLR service to a new station west of Route 440. 2. Environmental evaluation of the locally preferred alternative in accordance with the National Environmental Policy Act (NEPA). NJ TRANSIT has prepared an Environmental Assessment (EA) to evaluate the potential environmental effects of the HBLR Route 440 Extension Project. You can access the EA by clicking the links at the top of this page. 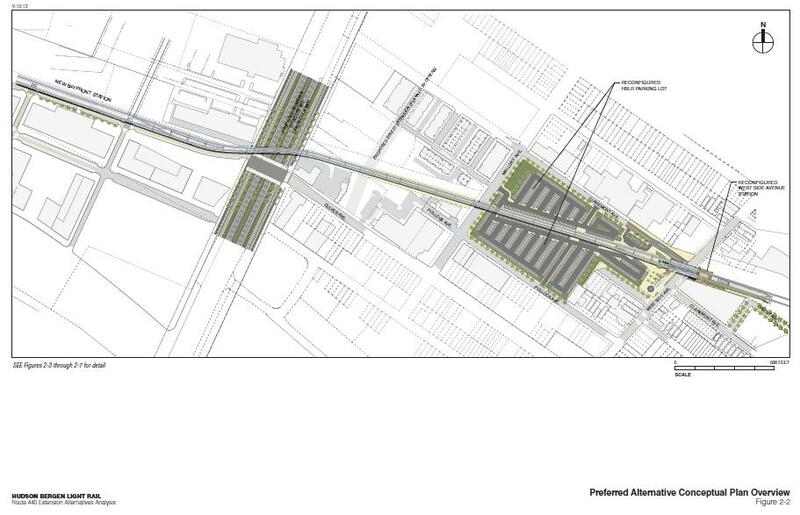 NJ TRANSIT Hudson Bergen Light Rail (HBLR) system is currently in the Preliminary Engineering phase. Field work is underway, including geotechnical borings, used to evaluate subsurface conditions in the project area. HBLR established this website to keep our customers and stakeholders informed about our System Extension as it moves forward. Please visit the website often for helpful information and updates. Your participation is encouraged throughout every phase of the project. We encourage your comments and questions and invite you to share your feedback with the project team.